Access to a Unix-like shell (this is written with bash in mind). macOS and *nix OSes (like Linux) should come with this or one like it. On Windows, you could install the CygWin environment, or on recent versions of Windows 10 use the "Windows Subsystem for Linux"
The base libraries for the KDE desktop environment. You don’t need the entire thing, especially if you already have another DE installed. Installing kdialog from the terminal. 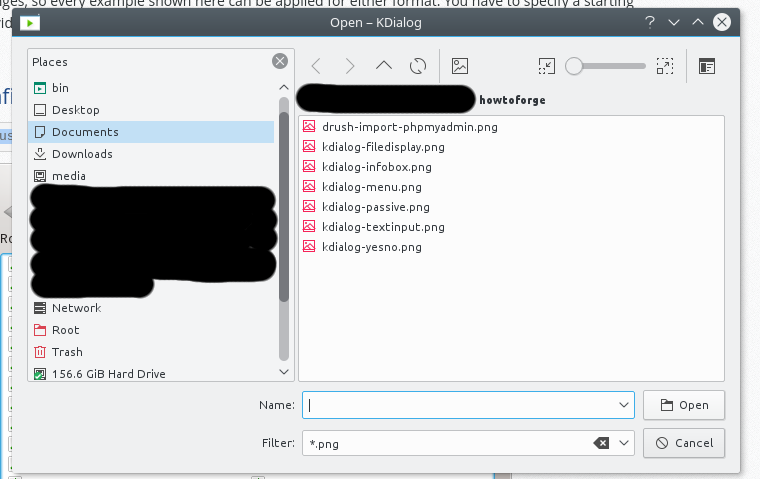 This will likely result in a sizable installation, as other KDE libraries and packages will be installed along with it. But hey, hard drive space is cheap, right? If we want to show the user some sort of feedback in a noticable way (i.e. not just some text spat out at the command-line). Show the user a message confirming the result, whether it’s a success or failure. 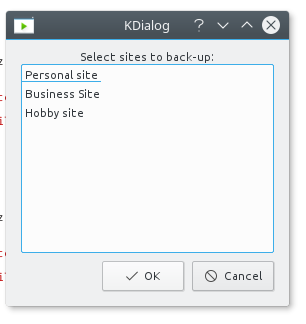 kDialog works by calling it at the command line along with a dialog type, any parameters that type may require, and any other options such as a dialog title. Displays a box with an "OK" button to close, providing a text message and either a "non-critical" information, warning, or error icon. This displays a message that will disappear within a few seconds, i.e. it doesn’t require the user to close or dismiss it. Like the "Information Message Boxes," this displays a dialog with an information/warning/error icon that will also provide the user’s selection of "Yes" or "No." This provides a single box into which the user can type some text. This will display the contents of a (plain text) file within a dialog box. The Menu and Radiolist Dialogs allow selection of one option. The Checklist Dialog allows selection of one, multiple, or all options. The Combobox Dialog allows the selection of one option using a drop-down menu. The user can combine kDialog with the dcop command to create a dialog that updates the user on the progress of an operation. The "Checklist Dialog" will allow us to select one, or all, of our sites to back-up. The "Information Message Box" can be used to display whether each of these has succeeded or failed. record whether it was successful or not. 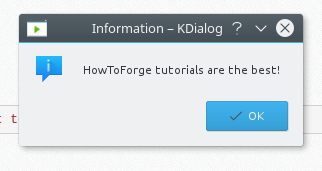 display another +kDialog+ with each of those results. RESULTS += "Personal site backup: Succeeded\n"
RESULTS += "Personal site backup: Failed\n"
RESULTS += "Business site backup: Succeeded\n"
RESULTS += "Business site backup: Failed\n"
RESULTS += "Hobby site backup: Succeeded\n"
RESULTS += "Hobby site backup: Failed\n"
// NOTE: display a dialog with the results of all the backup operations. If we save this and make we can run it as described in the first article in the Bash series we’ll be able to run a single command, get an easy-to-use dialog to choose our site, then see a nice window reporting back how everything went. While this script can certainly be optimized in a couple of ways, it demonstrates how you can use kdialog to collect some user input and display some results by running a single program within your script. This has to be the most idiotic article I have read all week. Having a dependency to the whole kde base system just to display a few simple dialogs is absolutely horrifyingly stupid if you aren't using KDE already. Yeah, hard drive space is cheap, but that doesn't mean I want to clutter it up with hundreds of MB of otherwise useless code. 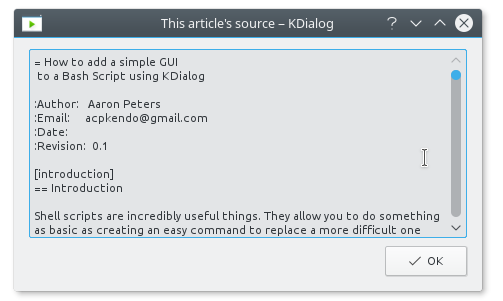 I'm already running the NEON desktop packages and adding a simple "apt install kdialog" installed ZERO extra packages so obviously this article applies to folks already running some kind of KDE desktop. As noted in the comments, use an alternative dialog system if you don't want the KDE "bloat". Please, leave the "I don't want KDE dependencies" negativity at the front door and respect that some people do use KDE and really appreciate an article like this.